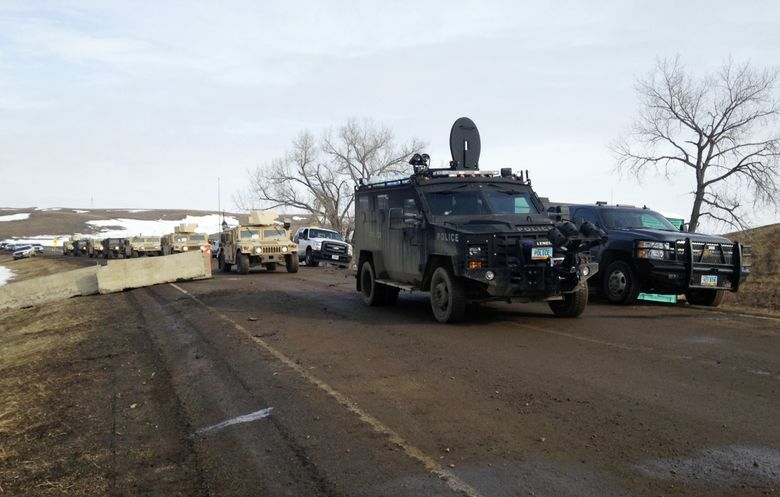 Police closed the North Dakota protest camp Thursday, with 46 protesters arrested. Many demonstrators vowed to continue their resistance in camps being established nearby. With 46 arrests and no injuries reported, police from around North Dakota and three other states cleared and closed the main camp used by protesters of the Dakota Access Pipeline by early Thursday afternoon. Police entered the camp Thursday morning in armored personnel carriers, as a helicopter and fixed-wing airplane circled overhead. Dozens of officers moved tent to tent and shack to shack with guns drawn, clearing out demonstrators. By 2:09 p.m. Central Time, it was all over. As many as 100 demonstrators were in the camp, according to activists, but authorities estimated 50. One group of veterans in a tent refused to leave and informed officers they would not be violent, but would go only with passive resistance. Officers carried them out, according to the Morton County Sheriff’s office. Most campers left Wednesday just before the deadline of 2 p.m. 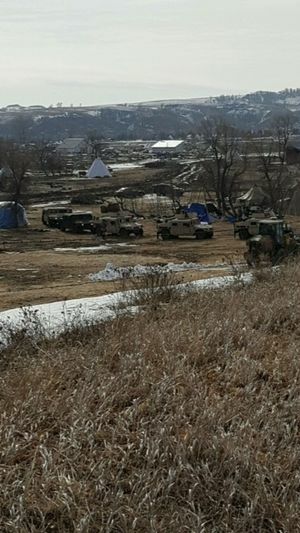 The governor of North Dakota ordered the camp cleared, citing in an evacuation order on Feb. 15 due to the risk of possible flooding. Police worked their way through the camp, making arrests of demonstrators. An operator of a large front-end loader meanwhile clawed at snow and debris, piling it for removal. 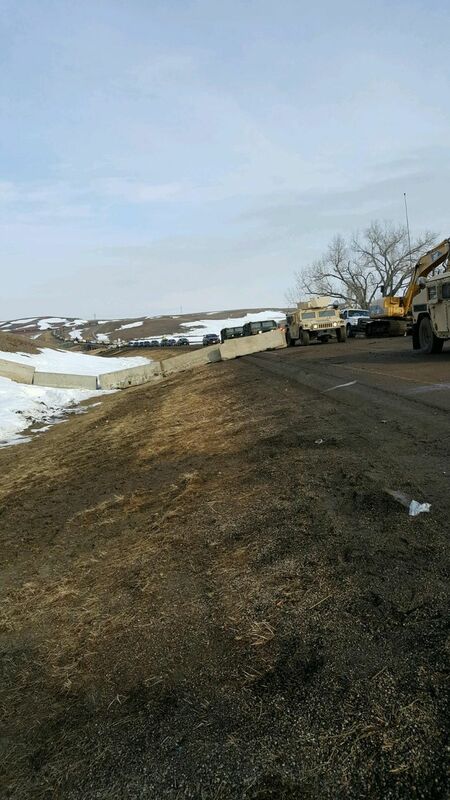 Protesters, who call themselves Water Protectors, were cleared out as the Dakota Access Pipeline is being completed. At its peak, the camp drew more than 10,000 pipeline opponents from around the world, including thousands of veterans. Opponents warned the pipeline could rupture and pollute the Missouri River, a drinking-water source for millions downstream of the pipeline’s crossing. The Standing Rock Sioux Tribe also argued it had not been adequately consulted, and that construction had damaged sacred sites. The historic gathering of native nations has no precedent in modern times. The fight became far larger than one project, growing to a movement across the country against fossil fuel development and other pipeline projects. Organizers already are gearing up against the TransMountain Pipeline from Alberta to Burnaby, near Vancouver, B.C., carrying tar sands oil and increasing by 7 times tanker traffic through the Puget Sound. Washington tribes, First Nations and their allies are already involved in that fight, as they were against the Dakota Access pipeline. Many demonstrators also vowed to continue their resistance to the Dakota Access Pipeline in other camps being established nearby. About 739 opponents of the pipeline from around the country have been arrested since demonstrations to block the pipeline began in August. Some are facing felony charges. The battle against the Dakota Access Pipeline continues in the courts. The tribe is awaiting its court date on its suit to block construction, and resume the long term environmental review that was underway of the pipeline, before the Trump Administration stopped it. Even if oil flows, as pipeline developer Energy Transfer Partners predicts by the second quarter, the tribe will intervene to stop it, Hasselman said. The Standing Rock Sioux tribe also has organized an indigenous people’s March on Washington, D.C., March 10. 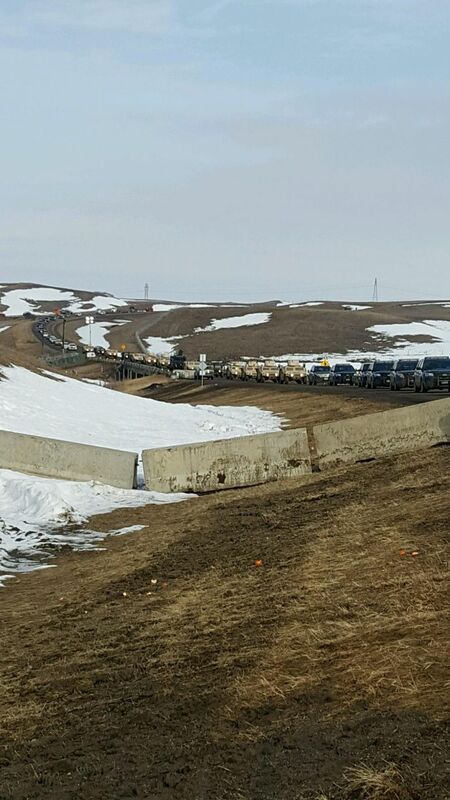 The Dakota Access Pipeline is being built to carry Bakken crude oil from Western North Dakota to Patoka, Illinois. Energy Transfer Partners of Dallas, Texas, maintains the pipeline is the safest and cheapest way to transport oil. Cleanup of the camp site will be done by a contractor awarded up to $1 million for the work, including cleanup of a nearby camp called Rosebud.